When Western companies first came to China they thought they would get rich if they could sell just one of their supposedly exotic items or dishes to every Chinese. They may not have been wrong, but that business model has changed. Now, those companies are trying to sell even the most Chinese of products to Chinese to make money. Blame it all on the global economic crisis and the shrinking markets of the US and Europe if you like. So now you have Starbucks selling zongzi (glutinous rice dumplings wrapped in reed), a delicacy served during Dragon Boat Festival, which this year falls on May 28. Zongzi owes its origin to folklore. Poet Qu Yuan of the ancient state of Chu (during the Warring States Period) committed suicide by jumping into a river on the fifth day of the fifth month after the Qins captured the capital of the Chu's. The poet's admirers threw crushed rice into the river and paddled out on boats to prevent the fish from feeding on his body. That gave rise to zongzi and the festival. 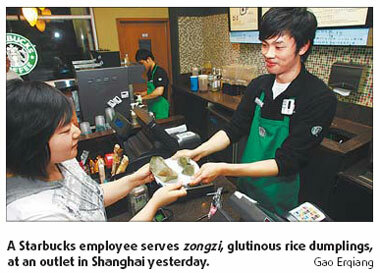 Starbucks has been selling dumplings, simply called "the sweets", since mid-April. The trial began in the Yangtze River Delta area, including Shanghai, and Zhejiang and Jiangsu provinces, where Starbucks has the largest number of its outlets in China. Caren Li, Starbucks (China) public relations manager, said yesterday that her dumplings have met "expectations" and have been welcomed especially by those looking for innovative products. But the Starbucks variety is expensive: each 45-gram dumpling costs about 12 yuan, when the going price for 150-gram zongzi in supermarkets is 3.5-4 yuan. Still, the coffee-shop chain expects to sell 20,000 to 30,000 boxes of dumplings that cost 98 yuan each, earning a revenue of 1.96 to 2.94 million yuan. This is not the first time Starbucks has tried its hand at selling Chinese products. In September last year, it tried selling Cantonese-style pancakes for 8 to 15 yuan each in Guangdong province. In January, it began serving coffee grown "South of the Clouds", that is, in Yunnan province. And during this year's Spring Festival, it served two types of coffee blended with tea, which still is the favorite beverage of Chinese. Starbucks has tried to roll out products tailored to local taste ever since it entered the Chinese market, Li said. But Starbucks is not the only food chain to improvise its products to draw consumers. Recession back home has prompted another US (fast) food restaurant chain, KFC, to sell youtiao, fried twisted dough, a Chinese favorite for breakfast. Earlier, KFC tried selling "Beijing-flavored" chicken rolls and pumpkin congee. McDonald's is focusing this year on offering "nutritious and delicious" Chinese breakfast, said Liu Xiaolin, Beijing McDonald's corporate communications manager. 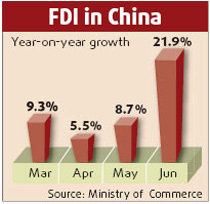 China is still "the most dynamic market in the world and also the most attractive for foreign chains". These companies have plans to expand their business in China, too. Starbucks opened its first outlet on the Chinese mainland in 1999, and in just 10 years, it has raised the number of to more than 350 in 26 cities. Last year, it opened 40 outlets despite the economic crisis. KFC and McDonald's, too, have announced ambitious expansion plans in China.